Stop by the best pizzerias in NY and find out why New York is the best place in the country to order a delicious pie. In case your stomach starts to grumble during your sightseeing trip, find out where to get the best New York pizza. Some of the Best NY Pizza you'll ever Taste! 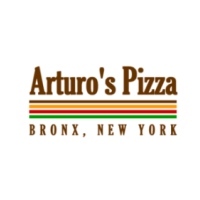 Order some of the most delicious pizza, pasta, salad, wings, and subs at Arturo's Pizza in New York! Expect quality food, fast delivery, and the best in customer service. All pizza, pasta, and meats are prepared daily, guaranteeing maximum freshness. Specialty pizzas include Hawaiian, Primavera, lasagna, chicken, margherita, salad, veggie lover's, and shrimp. In addition to pizza, the menu includes such tasty items as calzones and rolls, stromboli, burgers, chicken dishes, seafood dishes, heroes, gyros, grilled specialties, omelettes, and soups. Arturo's now accepts orders online for delivery or takeout. Restaurant hours are 11:30 A.M. to 11 P.M. everyday. Delivery/pickup hours are 11:30 A.M. to 11 P.M. on Wednesdays and Thursdays. Pizza Made with the Freshest Ingredients! Consistently providing customers with high quality, great tasting food; Emilio's of Morris Park showcases an expansive menu with tons of delicious items that are bound to make your mouth water. 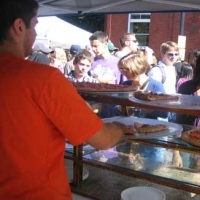 Order pizza, homemade sandwiches, calzones, pasta; and chicken, veal, and seafood dishes. All food items are made with the freshest of ingredients. Enjoy a scrumptious lunch or dinner in a friendly atmosphere with great music! If you're planning a special event, ask about Emilio's full catering menu. Restaurant hours are 10 A.M. to 11 P.M. on Mondays through Thursdays, 10 A.M. to 12 A.M. on Fridays and Saturdays, and 11 A.M. to 11 P.M. on Sundays. Great Pizza and Great Brunch! 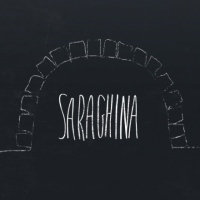 As one of the best pizzerias in New York, Saraghina believes in serving food with only the freshest, highest quality ingredients (including organic meats). Choose from a great selection of fresh pies that changes on a daily basis. The restaurant has a very relaxed atmosphere, complete with an outdoor garden where you can dine during the warmer months. Saraghina is a prime example of why New York is the pizza capital of the world! If you stop by for brunch you can feast on such items as french toast, yogurt with granola and fruit, organic eggs, and scones. Also available are espresso and cappuccino. 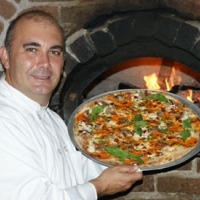 Enjoy Some of the Best Brick Oven Pizzas in NY! A truly authentic Italian restaurant in NY, Graziella's believes in using topnotch ingredients and serving up great portions. 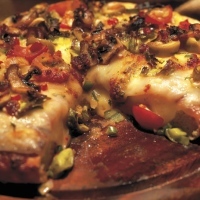 The restaurant's famous pizzas are baked in a 100% wood-burning brick oven. Choose from 11 wonderful varieties of pizza or try one of many other great menu items, including Mediterranean grilled octopus and eggplant rollatini. The family-owned, family-friendly restaurant is a great spot for private parties, as the venue accommodates up to 80 people. From May through September, you can enjoy a glorious outdoor dining experience on the rooftop patio, granting you beautiful views of the city. Graziella's pizza was even highly regarded by Ted Allen of The Food Network, who claimed it was the "best pizza he's even eaten"! The Best Sicilian Pie you'll ever Taste! Offering authentic Italian food of the finest quality, Umberto's is a go-to spot for the best New York pizza. The lovely two-story restaurant contains a full service cafe, four-star dining room, and world-class banquet facilities. The restaurant has gained nationwide popularity, attracting tens of thousands of guests each year. Pick from a selection of quality pies, including some of the best Sicilian pizzas you'll ever taste! In 2012 Umberto's was voted the "best pizza on Long Island" by the Long Island Press and has received several other rave reviews. Enjoy a slice of Brooklyn in New Hyde Park! A Fine Selection of Pizzas and a Premium Wine List! 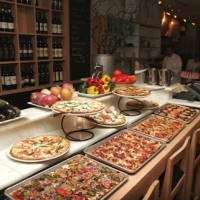 Choose from a large variety of delicious pizzas and a premium wine list at King Umberto. The warm, friendly atmosphere is perfected by extremely accommodating and professional waiters and waitresses, who will never fail to give you their undivided attention. The place is best known for its ultra-delicious "Grandma pie." The restaurant comfortably accommodates up to 80 people, making it perfect for private parties. King Umberto has received rave reviews from such prestigious sources as USA Today, Long Island Newsday, Zagat, and New York Magazine. Book your reservation today and prepare yourself for some of the best pizza New York has to offer! One of the Best Pizzerias in the Country! 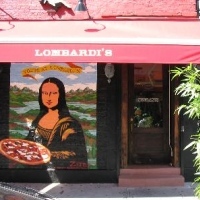 For over 100 years, Lombardi's has not only gained acclaim as one of the best pizza places in New York, but as one of the best pizzerias in the U.S.! Established in 1897, the pizzeria is easily one of New York City's oldest eateries. Order mouth-watering, smoky-crusted pizza with fresh tomatoes and mozzarella. Signature toppings include pepperoni, homemade meatballs, and clams. 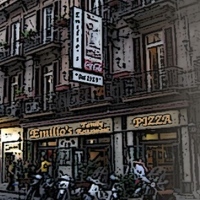 The well-renowned pizzeria has even been featured on The History Channel and The Food Network! Open 7 days a week for lunch and dinner, Lombardi's also offers a full bar with local beer on tap, as well as wine by the glass or bottle. A Legendary NY Pizza Joint! Open 7 days a week, Sal and Carmine is a great NY pizzeria that includes a menu of delicious pizzas with the toppings of your choice. 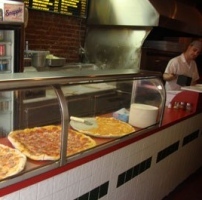 The family owned and operated pizza joint has been around for over 50 years, and remains legendary amongst New Yorkers. Discover the most flavorful combination of crust, cheese, and sauce that will ever meet your taste buds! Hours are 11:30 A.M. to 10 P.M. everyday. Dine-in and carry-out service are available. Get free delivery on Saturdays and Sundays, from 95th to 110th Streets. If you require any additional information, please call 212-663-7651 or send an e-mail to sandcpizza@gmail.com. One of the Best NY Pizza Restaurants! Serving up some of the best pizza New York has to offer, Adrienne's Pizzabar offers a combination of delightful pies and premium wines. Unlike your standard greasy pies; the pizzas at the restaurant are thin, light, and absolutely heavenly! 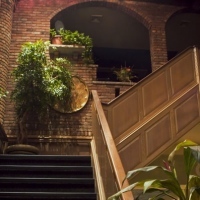 With a very calm and relaxing atmosphere, Adrienne's is a great place for romantic evenings or casual work meetings. Stop by for brunch, which is every Saturday and Sunday from 11:30 A.M. to 4 P.M. Adrienne's also offers outdoor seating on a historic cobblestone street. If you're planning a private party in the near future, inquire about the restaurant's catering options. A Great, Zagat-Rated Pizzeria in NY! Known for serving some of the best pizza in NY, the Zagat-rated Di Fara is one of the best pizzerias you'll ever find. The pizza's delicious sauce is perfectly concocted, using San Marzano tomatoes. Each pie is topped with buffalo mozzarella cheese imported from Italy. Plus, the crusts are always cooked to perfection. The New York pizzeria is BYOB and takeout is available. Di Fara is conveniently located, only a half a block away from the Avenue J Station in Brooklyn. The place is extremely popular with the lines sometimes going around the block, but the pizza is very well worth the wait! Order a Slice of Heaven at this Wonderful NY Pizzeria! Proudly serving fantastic pizza for over 55 years, New Park Pizza has received more than its fair share of accolades from the community. Order a slice of hot, fresh pizza with delicious sauce, crisp yet soft crust, and the perfect amount of cheese. See why multiple reviewers on Yelp and other online review sites have raved about this wonderful NY pizzeria! Even more discerning "pizza hounds" have lauded New Park Pizza as one of the best pizza places in NY. Hours are 11 A.M. to 12 A.M. every Monday through Sunday. If you need any more information, please call 718-641-3082. One of the Great New York Pizzerias! 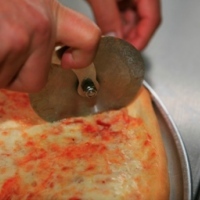 Consistently ranked as one of the top 10 pizzerias in New York, the pizzas at Gaby's are made using aged cheese, dough stretched out in olive oil, and sauce made from imported tomatoes from Italy. In addition to the pizza you will love the sausage, meatballs, baked ziti, and penna ala vodka. The venue offers plenty of seating, so even on the busier days and nights, you'll be able to find a table. Catering options are available. Hours are 11 A.M. to 11 P.M. on Sundays through Thursdays, and 11 A.M. to 12 A.M. on Fridays and Saturdays. Award-Winning Pizzas in New York! Creating gourmet, award-winning pizzas since 1992; Goodfella's Pizza has been featured on many TV stations, as well as in magazine articles and newspapers. Over the years, the place has become a local hot spot for politicians and celebrities. Enjoy exquisite artisan pizza made with such ingredients as fresh mozzarella, imported San Marzano tomatoes, extra virgin olive oil, and gourmet sauces created from scratch. 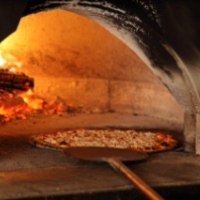 All pizzas are cooked in a real wood-fired brick oven at 800 degrees. In addition to topnotch Italian food, the restaurant offers a nice wine list and homemade sangria. To top it all off, the staff is incredibly friendly! Order Delicious Thin Crust Pizza! 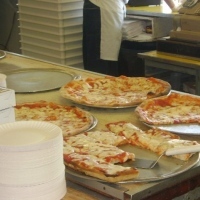 A family-owned pizzeria in NY, Joe & Pat's is known for serving some of the region's tastiest thin crust pizza. Established in 1960, the restaurant is completely family friendly and open 7 days a week for lunch and dinner. Pull up a table in the fully air-conditioned, expansive dining room. Draft wine and beer selections are available. Hours are 11 A.M. to 10:30 P.M. on Sundays through Thursdays, and 11 A.M. to 11:30 P.M. on Fridays and Saturdays. The pizzeria serves the Staten Island, Brooklyn, and Manhattan areas. If you have any questions, please call 718-981-0887 or send an e-mail to joeandpats@verizon.net. Try One of NY's Most Legendary Pizzas! 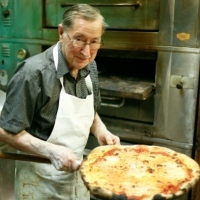 A one-stop Italian specialty shop, DeFazio's Pizzeria carries over 50 years of experience making quality pies in NY. All pizzas are made fresh in a wood-fired oven, and contain such ingredients as fresh chopped veggies and delicious homemade sauce. The grease-free pizzas at DeFazio's are absolutely legendary amongst locals in Troy, NY's Little Italy District. Top your pizza with such goodies as artichoke hearts, fontinella cheeses, Italian herbed chicken, homemade sausage, and spicy sliced eggplant. Try specialty pizzas in such varieties as white clam, fra diavolo, pesto, eggplant florentine, puttanesca, and General Tso's. 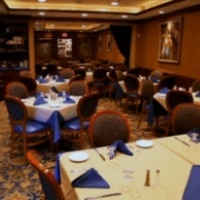 In addition to pizza, DeFazio's offers a great selection of pasta dishes and calzones. Brick Oven Pizza in Many Delicious Varieties! Offering Greenwich-style brick oven pizza, Soho Pizza is one of the many great places to buy quality pizza in NY. 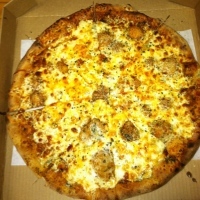 Gourmet pizzas include such unique varieties as chicken bacon ranch, chicken parmesan, white tomato basil, Mexican, tomato bacon ranch, teriyaki chicken, hot Buffalo chicken, BBQ chicken, chicken alfredo, white broccoli, and Soho Philly steak. In addition to pizza you're also given a fine selection of Italian dinners, gyros, cold subs, hot subs, and desserts. Hours are 2 P.M. to 2 A.M. on Sundays through Thursdays, and 2 P.M. to 4 A.M. on Fridays and Saturdays. Soho delivers to Albany and certain areas of Loudonville. If you need any additional information, please call 518-449-1111 or send an e-mail to info@sohopizza.com.